The New Flir E50bx infrared camera offers a 240x180 IR pixel resolution giving 43,200 temperature measurement points on each image. With a thermal sensitivity of 45mK or less that 0.045°C it means that much smaller temperature differences can be seen. This added to the impressive 240 x 180 IR resolution gives amazing detail on your images. 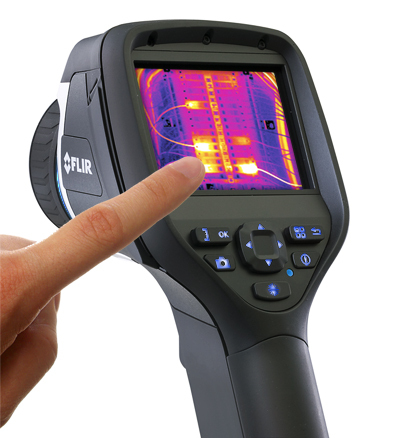 The Flir E50bx thermal imaging camera includes many features that prove invaluable for building inspections. These include insulation alarms which can clearly show missing insulation and a dewpoint alarms which will show areas on your images where condensation is likely to occur leading to damp and mould problems. The Flir E50bx also includes a best in class 3.1 megapixel digital camera allowing visible images to be recorded in addition to the IR image and the ability with the Pip (picture in picture) function for a scalable IR image to be superimposed onto the visible image for added detail in your reports. The camera also includes powerful LED lights to allow you to take visible images in dark environments. The Flir E50bx also features Meterlink allowing the transfer of data taken with the Extech EX845 clamp meter, or Extech MO297 moisture meter to the corresponding image on your camera and thus saving you the time of recording the measurements manually and the possible errors that can arise in matching them back to the image when compiling your report. Wirelessly transmit data from a moisture meter or clampmeter to the Flir E50bx via bluetooth. The measurements are displayed on the screen and then captured when you save the image. 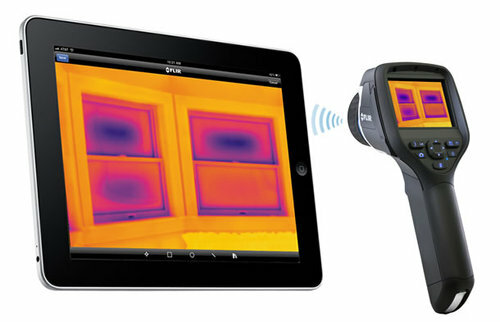 The Flir E50bx 1-4x continuous digital zoom. Fully scalable function for overlying the infrared image on the visual image while retaining all measurement data. A conveniently located button activates the laser locator that will help you associate the hot or cold spot in the IR image with the real physical target in the field. On the Flir E50bx the laser market is also displayed on the IR image itself for accurate positioning.